Hainrihi's Discoveries: Personal Post | Why is Blogging Extremely Rewarding For Me? Personal Post | Why is Blogging Extremely Rewarding For Me? This year, I had so many life changes that I became busy with work and some extra curricular activities. Because of this, I had so many blog hiatuses so I could get my life back on track. But every time I go back from those hiatuses and posted a few blog posts before going to a hiatus again, I felt happiness and becoming fulfilled. It was through this feeling that I told myself I don’t want to go on hiatus again because I want to blog as much as I can. I want to share information of the things I discovered in my little adventures. Every time I finish writing and posting a blog post, I feel I have accomplished something and have made my blog more worthwhile than before. This is one of the reasons why blogging is so rewarding. When I was in hiatus, I missed blogging a lot, but I knew I had to finish organizing my life first so I can blog without any interruptions. So far, my life is in order and it feels so good to blog more now. While I haven’t reached my goal yet (I plan to write a minimun of three posts per week), at least I am continuously writing drafts that I can post anytime. After writing and posting, I feel a sense of accomplishment because I am sharing something worthwile in every post. My goal is to use this blog insharing my experiences and discoveries that I know other people will find useful. I still have a lot of work to do to make this blog grow more, but it is improving. Speaking of pictures, if there is one thing that makes a blog fulfilling and accomplished, it’s putting great and nice quality pictures in every blog post. I make it a point to at least put a minimum of two pictures taken from my own camera to make the post more personalized. But since I am not a professional photographer, I still feel something is lacking in my blog pictures. I know I can make them better and this is the reason why I want to attend the Basic Photography Tips and Tricks for Bloggers Workshop. How amazing is that? I have never been to a photography workshop before, so this is my first time and I’m bringing my boyfriend with me who is also interested in photography. I am so excited to attend this! Basic Photography Tips and Tricks for Bloggers is brought to you by Bloggers Ng Pinas, co-presented by Nikon Philippines. 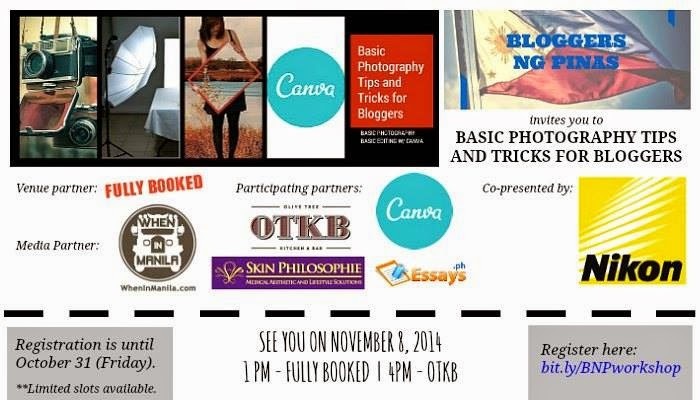 Thanks to Fully Booked for accommodating us and to Nikon Philippines, Canva, Essays.ph, Olive Tree Kitchen and Bar, Skin Philosophie, and WhenInManila.com for the support!